Entry and participation in any competition on MOBO.com shall be deemed an unconditional acceptance by you of these Terms. All entry instructions and any other specific details relating to the competition or the prizes form part of these Terms. · Competition closes on date and time specified in competition guidelines. · Open to UK residents aged 16 years and over only. · There is one main prize (unless runners up are specified) for each competition winner which will be delivered via mail or collected from MOBO HQ. For gig competitions, we will specify in the competition guidelines whether tickets must be picked up from the venue or otherwise. · Prizes are as stated and no alternatives will be offered. · The winner for any competition will need to respond to the first point of reference within 24 hours. If this person fails to do so, another competition winner will be chosen at random. · All entries must be made directly by the person entering the competition. · Use of a false name or other details will result in disqualification. · We reserve the right to amend or alter the terms of competitions at any time and reject entries from entrants not entering into the spirit of the competition. · The winner(s) agree(s) to the use of their name and members’ details and will co-operate with any other reasonable requests relating to any post-winning publicity. · Competitions on Facebook/Twitter/Instagram - to enter followers must RT/Share/Like (where necessary) and include the relevant hashtag. Winners will be direct messaged. • Entrants to MOBO UnSung must reside in the United Kingdom. • Entrants must not be signed to a major or independent record label. • Deadline for entries is August 12 at 23:59. • The 10 finalists are expected to attend the final judging panel day in London and organise and pay for their own travel. Downs Festival Competition - win tickets to Downs Festival 2019! - Competition closes April 23 at 4pm. After this date the no further entries to the competition will be permitted. - The Prize: x2 tickets to attend Downs Festival 2019 in Bristol, which is non-transferable and excludes travel and accommodation. Amount: 6 tickets in total. - The promoter reserves the right to cancel or amend the competition and these terms and conditions without notice in the event of a catastrophe, war, civil or military disturbance, act of God or any actual or anticipated breach of any applicable law or regulation or any other event outside of the promoter’s control. Any changes to the competition will be notified to entrants as soon as possible by the promoter. - The prize is as stated and no cash or other alternatives will be offered.The prizes are not transferable. Prizes are subject to availability and we reserve the right to substitute any prize with another of equivalent value without giving notice. - The promoter will notify the winner when and where the prize can be collected / is delivered. - Competition closes October 17 at 4pm. - The Prize: x2 tickets to attend the exclusive MOBO Movies screening of The Hate U Give at a secret location on October 21 in London, which is non-transferable and excludes travel and accommodation. Amount: 14 tickets in total. - Seats for the screening will be provided on a first come, first served bases so it is imperative that competition winners arrive on time to ensure they are guaranteed a seat at the screening. - Winner Notification: Each winner will be contacted via the platform they entered on, Instagram, Facebook or Twitter Direct Message and will be required to respond to confirm identity, eligibility, plus acceptance of the prize within 24 hours of initial contact. In the event a winner does not respond to communications within 24 hours of initial contact, the Promoter reserves the right to disqualify that winner and the prize will be allocated to an alternative entrant selected in the same manner. - The Promoter of this prize draw is MOBO Organisation Ltd, Somerset House, Strand, London, WC2R 1LA. Competition enquiries team may be contacted via team@mobo.com. - The decision of the Promoter regarding any aspect of the prize draw is final and binding and no further correspondence will be entered into about it. 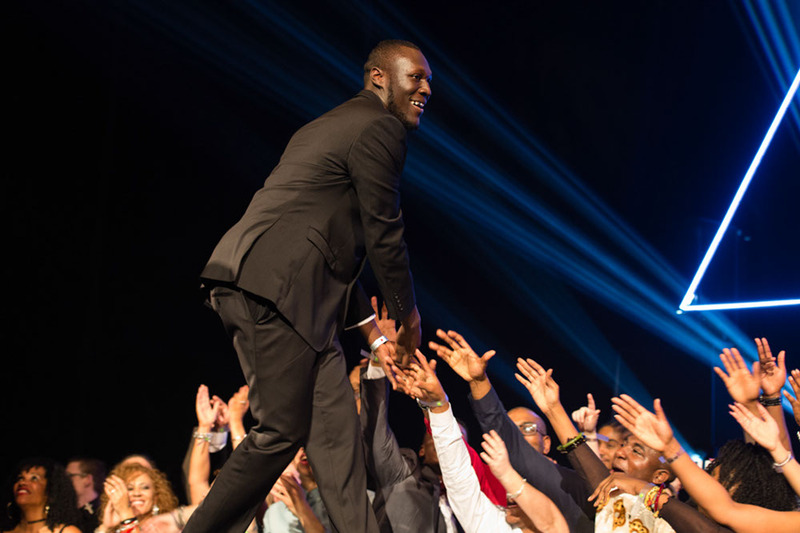 Newsletter Competition - Win MOBO Awards Tickets. 1. This Promotion is only open to legal residents of United Kingdom and the Republic of Ireland aged 16 or over, excluding employees of the Promoter, their families, agents or anyone else professionally connected with this Promotion. 3. Purchase not necessary and Internet access is required. 4. To enter, entrants must subscribe to our newsletter and complete the form listed here by May 25. 5. The Prize: 1 x pair of VIP tickets to attend the 2018 MOBO in the United Kingdom, 10 runners-up will also recived x1 pair of arena tickets, which is non-transferable and excludes travel and accommodation. Amount: 2 VIP tickets (1 winner) and 20 arena tickets (10 runners up) in total. Travel and accomodation is NOT included in the prize. Winner Notification: Each winner will be contacted via email and will be required to respond to confirm identity, eligibility, plus acceptance of the prize within 24 hours of initial contact. In the event a winner does not respond to communications within 24 hours of initial contact, the Promoter reserves the right to disqualify that winner and the prize will be allocated to an alternative entrant selected in the same manner. While the date and location for the 2018 MOBO Awards will be announced soon, MOBO can confirm that it will take place in the United Kingdom. · The Promoter reserves the right to refuse to award the prize to anyone in breach of these terms and conditions. · The Promoter reserves the right to hold void, cancel, suspend, or amend the promotion where it becomes necessary to do so. - The Promoter will not be liable for any prizes which are lost, delayed, or damaged in the post for reasons beyond our control. - Where prizes are to be delivered to the personal address of a winner, the prize will only be delivered to an address within the UK and ROI and will only be sent once. Should a prize winner's contact details change, it is their responsibility to notify us or the contact persons for the relevant promotion. · Insofar as is permitted by law, the Promoter, its agents or distributors will not in any circumstances be responsible or liable to compensate the winner or accept any liability for any loss, damage, personal injury or death occurring as a result of taking up the prize except where it is caused by the negligence of the Promoter, its agents or distributors or that of their employees. Your statutory rights are not affected. · Winners may be required to participate in publicity related to the prize draw which may include the publication of their name and photograph in any media. · Personal data supplied during the course of this promotion may be passed on to third party suppliers only insofar as required for fulfillment/delivery/arrangement of the prize. · Entrants to MOBO Moments must be based in the United Kingdom. · Deadline for entries is Monday 31st October, 2016. · Prize elements will be provided to finalists once a winner has been publicly announced. · MOBO Organisation reserves the right to adjust any terms and conditions at any time. 1.Join the MOBO Movement is open to anyone with a valid British passport. If you are under 18 years old you must have the permission of your parent or guardian, who must have read and agreed to these Terms and Conditions on your behalf. d) confirm their acceptance of these Terms and Conditions. The Promoter reserves the right to request acceptable evidence of the above, and may disqualify any entrant who fails to provide such evidence upon request. 3. Employees (or family members of employees) of MOBO may not enter this Promotion. 4. To take part in this Promotion, create a video in accordance with the brief and upload it to You Tube before 23.59 (British Summer Time) on 1 March 2017. By uploading your video your YouTube username will be automatically associated with your video and submitted to the Promoter. You are responsible for ensuring that both your YouTube account and the email address linked to your YouTube account are active. 6. Multiple or duplicate entries] will be invalid. 8.Videos uploaded after this time will not be valid. The Promoter will determine the time of upload. f) your entry does not contain any discriminatory, obscene or defamatory material, does not include (whether by image, gesture, statement or other material of any kind) any violence, cruelty to animals, weapons, religious iconography or anything which may reasonably be considered to be offensive, anti-social, inflammatory or otherwise objectionable, and is not otherwise illegal under English law, or the law in the country in which you are normally resident. 10. You agree that the Promoter may commercially exploit your entry as it sees fit, including without limitation through third party advertising which may appear in connection with your entry, without any payment to you. 11. You agree that the Promoter may, at its sole discretion elect not to publish, use or exploit your entry or any part of it in any way and, if it does elect to publish, use or exploit your entry or any part of it in accordance with these Terms and Conditions, the Promoter may, at its sole discretion, stop publishing, using or exploiting your entry at any time. 12. You agree that the Promoter may edit or adapt your entry in any way and you waive any moral rights. 13. The Promoter will select a short list of finalists. The finalists will be those who, in the opinion and sole discretion of the MOBO judges, have demonstrated the greatest ability to become an ambassador for the MOBO brand. The judge’s decision shall be final and binding. 14. The winners] will be the registered account holders of the YouTube account used to upload the winning entries and the winners will be notified by email within 14 days of the Closing Date. 14b. If the Promoter decides that none of the entries are of sufficient quality to be shortlisted then it shall be entitled to cancel the competition. 15. The Prize for the competition will be the role of brand ambassador for MOBO. 16. If any winner is not able, for any reason, to accept the Prize, or does not respond to the email notification within 5 working days of the competition winner being announced the Promoter reserves the right to award the Prize to another entrant. The Promoter shall be automatically released from its obligations to the original winners. 17. In order to claim the Prize the winners must enter into a standard presenter’s contract in which all intellectual property rights will be assigned to the Promoter for no remuneration. (iii) any liability that is non-excludable as a matter of law. c) any act or default of any third party. 20. The Promoter does not accept responsibility for network, computer, hardware or software or other technical failures of any kind, which may affect the sending, receipt or processing of your entry. Entries must not be made through agents or third parties. Incomplete entries will be disqualified and will not be counted. 21. If the Promoter has grounds to suspect any entrant or third party of cheating, deception or fraudulent or unsportsmanlike conduct of any kind (including, without limitation, manipulating the promotion, choice of prize winner(s) or any entry) the Promoter reserves the right (in its sole discretion) to disqualify any entrant, entry or person it reasonably believes to be responsible for, or associated with, such activity. 22. The Promoter’s decision is final and binding in all respects on all entrants. No correspondence will be entered into. Entries that do not comply in full with these Terms and Conditions will be disqualified. 24. The Promoter reserves the right to pass on any entry which causes it concern (including any associated personal details) to the relevant authorities, at its sole discretion and/or where such disclosure is required by law. 25. The Promoter reserves the right to amend these Terms and Conditions at any time. 26. The Promoter will use each winner’s, and each entrant’s, personal details for the purpose of administering this Promotion, and publicizing the winner. 27. Please note that your data may be processed on a server outside of your country of residence, including on servers in the United States and United Kingdom. You may request to view, edit or remove your data at any time by contacting the Promoter using jointhemovement@mobo.com. If you request that your YouTube username and/or country of residence is removed, you will no longer be eligible to win the Prize. 28. You irrevocably agree that the Promoter and its sponsors and brand partners shall be entitled to use your name and likeness for all advertising, marketing, publicity and public relations purposes without additional remuneration. You also irrevocably agree to co-operate with, and take part in, reasonable publicity for and on behalf of the Promoter and its sponsors and brand partners upon request, which shall include (without limitation) press and promotional activities, without additional remuneration. the courts of England and Wales shall have exclusive jurisdiction to settle any dispute or claim that arises out of or in connection with this Promotion (including the Prize).